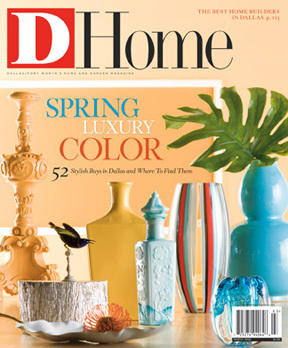 By D Magazine | 11 years ago The prettiest new things to buy and covet from some of Dallas’ most stylish shops. By Christine Lieb | 11 years ago A mother-daughter duo makes the old new. By D Magazine | 11 years ago Why fight the elements when it’s so much more fun to join them? By D Magazine | 11 years ago Classic objects with a fun new twist. By Peggy Levinson | 11 years ago Dallas designers and showrooms are branding in a big way with a slew of new coffee table books. By Peggy Levinson | 11 years ago Savor a variety of soufflés in one of the most talked about restaurants in town. By Amanda Tackett | 11 years ago Decades of neglect had left my Dream House in shambles. Before I could lift a hammer to start the renovations, I had to give her a good, long bath. By Loyd Zisk | 11 years ago The ASID pens a guide for eco-friendly interiors; City of Dallas launches country’s first web site on green topics; beautiful green products for the home. By Mary Candace Evans | 11 years ago Lake Highlands has a distinctive country feel. By D Magazine | 11 years ago Architecture student Jay Cantrell likes to keep his sketchbook handy. His drawings of Dallas’ changing skyline make him equal parts artist and historian. By Rebecca Sherman | 11 years ago Interior design, like life and people, is trending toward a grand mix, which is more interesting and way more modern. By D Magazine | 11 years ago The beauty and craftsmanship of this 1940s Colonial Revival-style house designed by Julio Quinones unfold subtly like a work of fine art.